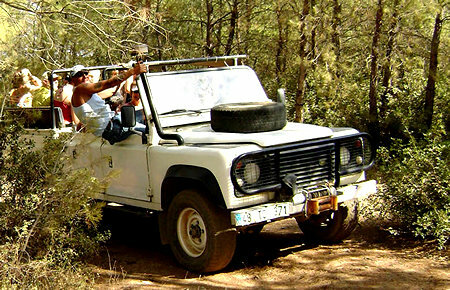 Fun and Adventure are best used to describe our most popular excursions. Just half-hour outside Kusadasi and you will find yourself in pine scented forests, unspoiled villages, and remote coves. 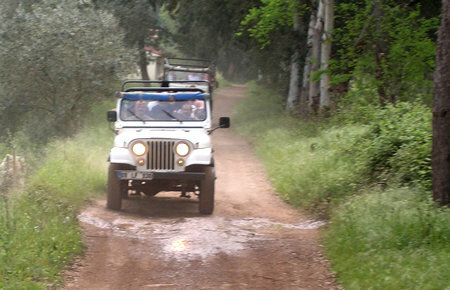 All ages will enjoy the beautiful scenery as you travel in 4x4 Jeeps which give you the best panoramic views. The route consists of 60 km on-road and 40 km off-road drive through the Samson National Park, divided by regular stops at Zeus Cave, the Echo Valley, the Monastery and Waterfalls. Enjoy the great scenery of the Aegean Islands, while having your lunch at 1000 metre peak. 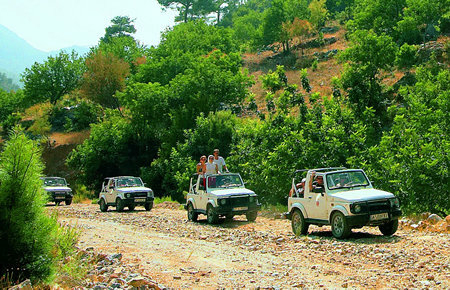 Our travelers enjoy a mouth watering barbeque and fresh salad at lunch on our Kusadasi Jeep Safari. The tour ends with a dust wash-off break at the Long Beach. Hop on your Jeep and to discover the wonders of nature just beyond your resort. You may choose to make your own way to the free pick up point at the statue in front of , but you must contact us at least 24 hours prior to the tour, otherwise the bus will not stop in front of .